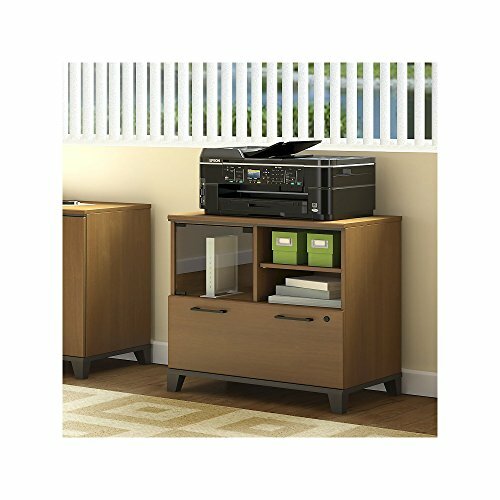 The Bush Furniture Achieve Printer Stand File Cabinet adds modern flair to your home office or small business. Enjoy open and closed storage options while setting up your printer on the rugged work surface. Get organized thanks to an open storage compartment with adjustable shelf and a locking file drawer for letter or legal size documents. A great combination for a seamless look, the heights of the L Shaped Desk (sold separately) and Printer Stand File Cabinet match to extend your work surface. Contemporary and sophisticated, Achieve works well in any setting. Solidly constructed and Tested for wear and stain resistance, this quality furniture meets ANSI/SOHO standards for safety and performance. Backed by a Bush Furniture 6 Year Manufacturer's Warranty, Achieve features stylish tapered legs, and comes in Sweet Cherry with Brushed Nickel hardware, or Warm Oak with Black hardware. See the full collection for coordinating items available. American made with U.S. and imported parts.